N.B. Translate.google.com is helpful for translating webpages between languages. http://scsmath.com. The official website of Sri Chaitanya Saraswat Math with thousands of webpages including archives since 1995 of news, discources, books, articles and guidance for devotees. Sri Gaudiya Darshan established to please Sri Hari, Guru, and Vaishnav by propagating the message of Sri Bhakti-siddhanta. Published from Nabadwip. Sri Chaitanya Saraswat Bookstore, online purchases of books and CDs. Veranda Views. Pictures of His Divine Grace Srila Govinda Maharaj and associates, posted by Jamuna Priya Devi Dasi with often daily updates mainly spanning 2005 to 2010. Earlier telephone talks of Srila Govinda Maharaj with Madhusudan Prabhu of Hawaii. Extensive coverage of the Californian leg of Srila Govinda Maharaj's 21st World Tour (2004). London Sri Chaitanya Saraswat Math's website with news and substantial articles. The Seva Ashram Post is full of articles by our Guru Varga and leading Vaishnavas of our society illuminating the unique expressions and explanations of Krishna Conciousness coming through the line of Sri Chaitanya Saraswat Math. Published from California. The Seva Ashram News shares with you the current events of the California Seva Ashrams. California's earlier website with local news, videos and events which now remains online as an archive of earlier postings. Salt Lake City, Utah. Website by the local Sri Chaitanya Saraswat Mission. Extensive extracts from the Math's publications in English and Spanish, hosted by Nimai Chandra Prabhu. Sripad Bhakti Madhava Puri Maharaj's website including much reading material. Sripad Bhakti Chandan Parvat Maharaj's site with pictures from USA and Mexico. Sripad Bhakti Lalita Akinchan Maharaj's blog. Sri Guru Vandana: extensive articles, audio (kirttan, lectures, spoken books), and picture collections. Includes rare material and video. Canada's 'Human Inquiries' introducing our Sri Guru Parampara. The main Russian language website with lots of information and activities. Russian Internet radio, with Russian and English sections. Spanish website from Mexico, with regular updates of pictures, texts, translations and audio. Maintained by a team of devotees headed by Jagannath Suta Prabhu from Monterrey. Spanish website from Venezuela, with regular updates of pictures, texts, translations and audio. Maintained by our Ashram in Caracas, Venezuela. Portuguese language presentation website of 'Sri Krishna Shakti Ashram', the principal centre in Brazil. 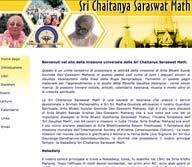 German website, inaugurated August 2007, presenting news and teachings of Sri Chaitanya Saraswat Math. Italian language website run by Krishna Kanta Dasi, 'Villa Govinda Ashram' near Milan. Italian language website first started by Mohita Krishna Prabhu, Perugia centre, near Rome. Turkish language mirror website of scsmath.com, maintained by Krishnendrani Devi Dasi of Turkey. Polish language website, regularly updated. Japanese website, translations by Ajitasha Devi Dasi, and pages by Krishnendrani Devi Dasi. Philippines website in the local Tagalog language, launched March 2008. Spanish translation of Sri Sri Prapanna Jivanamritam, prepared by Tapanandini Devi Dasi of Mexico. Spanish translation of Sri Chaitanya Bhagavat, prepared by Tapanandini Devi Dasi of Mexico.